You can easily import data into the software but it MUST be formatted correctly. This will be discussed here. You can only upload one type of event at a time. 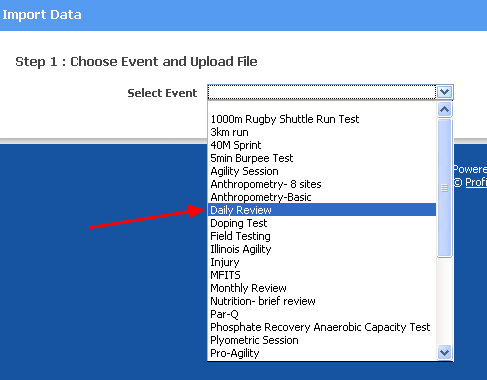 You can enter multiple records for your athletes, but you can only enter in one type of event on each import that you perform. Choose from the drop down list what information you want to import. 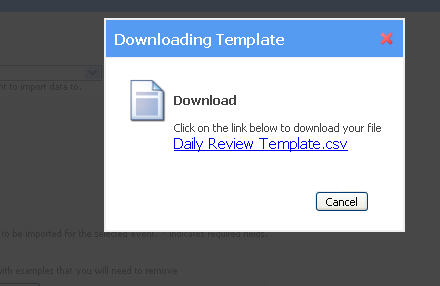 The example here shows that Daily Review has been selected. As soon as you select to import a specific type of information, the available fields list will show you what column names you will need to include when you import the data. For the Daily Review form, this will include First Name, Last Name, Start Date and Time and the then fields e.g. Stress/Pressure, Sleep Quality, Soreness etc. When you import data into the system you need to be able to match the information to the way it is stored in this system. The Stress, Pressure and Energy fields are all rated on a scale of 1-5, so you will not be able to import data into the system if you have rated stress as "High" or "Low". To check how each question field is formatted, select the Generate Template button. This will show you exactly how the spreadsheet needs to be formatted, and the way the questions are generated (see below). Click Generate to see the data you can import. Each "Generate Template" will be different depending on the type of information you are importing. The example here shows that as the Stress/Pressure etc fields are numeric. If the fields were a drop down or single selection, these selections would be listed here as well underneath each of the field names. Complete the generated template, or import your own file. IT MUST be saved as a .csv or the file will not import. When you have formatted your spreadsheet to include the athletes name, date and time of entry followed by the form fields, you can start to import your data. Look through your documents and then click on the appropriate document that you want to upload. 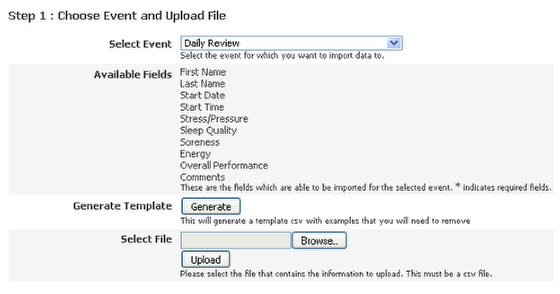 The example here shows that the "Daily Review" file will be uploaded. Remember that the file MUST be a csv file or the system will not be able to read it. The system will automatically try and match the users on the system, with the usernames you just entered. If their name does not appear in the "Athlete to Import Data For" box, you can just start typing in the athlete's name into the box and all possible matches will appear. The example above shows that when we were mapping a name to ben demo, as soon as "be" is typed into the search box, the appropriate match appears. Click on their name. 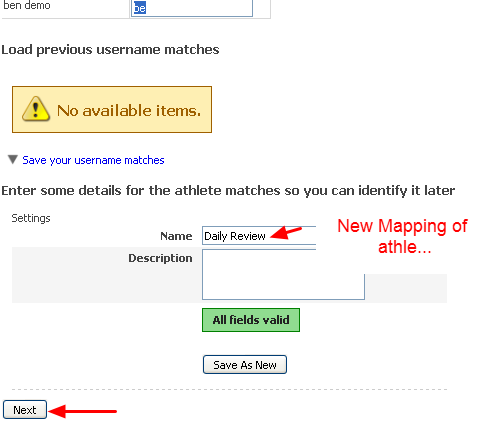 You can save the specific username map by clicking "save your username matches"
If you save the user mapping, next time you import data for these athletes, the system will use your map to match up the athletes. For this example we will save the athletes matches as "Daily Review" and click "Save as New". The matches will be saved and can be used later. The system will automatically try and match up the column names in your spreadsheet with the field names in the event. Then these matches will be displayed for you to double check that the right information is being matched between the two data sets. When you import the data in, you can see that the column names have been matched correctly (e.g Energy to Energy, Stress/Pressure to Stress/Pressure. Double check that these match or you could import the wrong information into the wrong fields! You must match up the date FORMAT correctly or the import will fail. When you import the data into the system you need to remember the data format that was on your original spreadsheet that you imported. For this example the date format (in box #1) is 24/09/09. 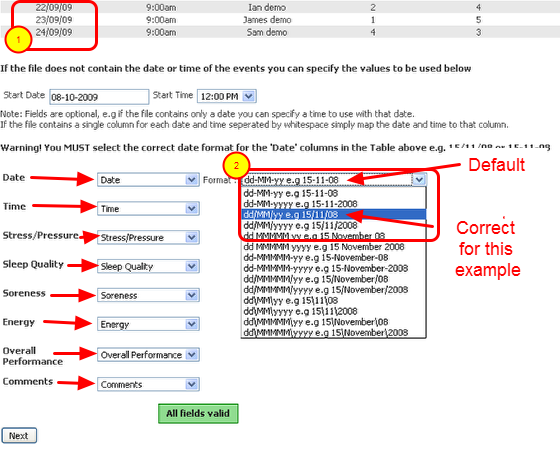 The default date setting for the Date format match (box #2) is dd-MM-yy e.g.15-11-08. These two formats ARE DIFFERENT. You need to match the formats so that they are the SAME. This means you would need to click on the dd/MM/yy e.g. 15/11/08 in the date drop down list. If you have any doubt, go back to your original spreadsheet, check the date settings and then come back and match up the date formats correctly. When you have checked the date format and the field matches and you are confident they match, click "Next" to Import. You will then be shown a report of whether the import was successful or not. The report here shows that 15 of the 16 records were imported successfully. However, one record was not formatted correctly. This error is available to download instantly to see why the error occurred. Now you can go to the reports page to look at the recent import, or you can carry on importing more data.